N A T I O N A L S ! 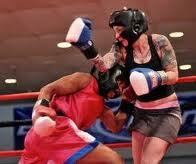 Yep, Women’s Amateur Boxing Rules! Cool fact! This year’s women’s national champions will give us all a look at the possible Olympians for next year’s Olympic games in London! As a reminder the three Olympic divisions are: Flyweight (112 lbs). Lightweight (132 lbs) and Middleweight (165 lbs). So look for the defending champions in the three Olympic weight divisions to rock the house: flyweight Marlen Esparza (Houston, Texas) competing for her sixth straight national championship, lightweight Queen Underwood (Seattle, Wash.) boxing for her fifth title and middleweight Tiffanie Hearn (Louisville, Ky.) vying for her second consecutive middleweight crown and third overall. The going won’t be easy though as there are a record 36 women vying for the Lightweight title alone this year including 2010 National PAL Champion Stephanie Han (El Paso, Texas), four-time winner Caroline Barry (Boulder, Colo.), former featherweight national champions Melissa Parker (Camp Lejeune, N.C.) and Jody Ann Weller (Pomona, N.Y.), as well as 2010 bantamweight gold medalist Lauren Fisher (Dania, Fla.). The middle weight division is no lock either with 21 entrants including Franchon Crews (Baltimore, Md.) who was AWESOME in the Pan Am trials, plus former light heavyweight champion Tika Hemingway (Pittsburgh, Pa.) and defending heavyweight titlist Denise Rico (Los Angeles, Calif.) both of whom moved down to the middleweight division in the hopes of making the team. 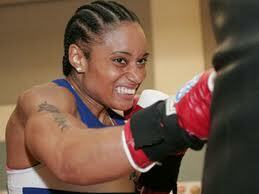 Action will begin for the Olympic weight classes on Monday with the start of their preliminary bouts. 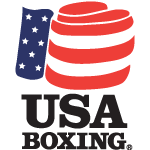 According to USA Boxing’s rules, the athletes in the three Olympic divisions will need to win their preliminary bouts and the quarter finals to earn a place in Thursday’s semifinal action. 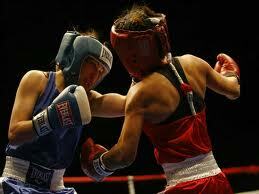 Only Semi-finalist and above will be able to clinch a spot in next year’s U.S. Olympic Team Trials for Women’s Boxing. The roster of fighters set to compete is impressive to say the least! Natalie Gonzalez, New Rochelle, N.Y., Elizabeth Rodriguez, Gilroy, Calif., Lisa Ha, Honolulu, Hawaii, Vanessa Guzman, Chula Vista, Calif., Marina Ramirez, Las Vegas, Nev., Amy Sowers, Bozeman, Mont. Amanda Pavone, Burlington, Mass., Rayleen Williams, Lincoln, Del., Rosa Rodriguez, Miami, Fla., Tiffany Griffin, Chicago, Ill., Shanice Herron, St. Louis, Mo., Shanne Ruelas, Fresno, Calif., Bryonna Jumandig, Tacoma, Wash., Haley Pasion, Waipahu, Hawaii, Nephateria Miller, New Haven, Conn., Lindsay Bartels, Omaha, Neb., Amanda Pavone, Burlington, Mass., Erica Rosenburg, Fountain, Colo.
Comel Chandler, Brooklyn, New York, Tiara Brown, Lehigh Acres, Fla., N’yteeyah Sherman, Barberton, Ohio, Marianne Kraus, Indianola, Iowa, Jeanelle Leal, Corpus Christi, Texas, Earnestine Wesley, Garland, Texas, Amorena Baca, Denver, Colo., Jayli Fimbres, Newton, N.D., Brenda Gutierrez, Sacramento, Calif., Maira Madrigal, Wenataliee, Wash., Lisa Porter, Northridge, Calif., Caroline Barry, Boulder, Colo. (Four-time National Champion), Melissa Parker, Camp Lejeune, N.C. (2009 National Champion), Mikaela Mayer, Marquette, Mich., Stephanie Han, El Paso, Texas (2010 National PAL Champion), Queen Underwood, Tacoma, Wash. (Four-time National Champion), Jody-Ann Weller, Pomona, N.Y. (2010 Featherweight National Champion), Darina Mims, Greensboro, N.C., Tiara Brown, Lehigh Acres, Fla., Bertha Aracil, Yonkers, N.Y., Storm Chandler, Brooklyn, N.Y., Robin Conroy, Wilmington, N.C., Stefanie Taylor, West Hills, Calif., Jasmedh Rosales, Los Angeles, Calif., Micaela Arce, Reno, Nev., Rita Martinez, Las Cruces, N.M., Madeline Guzman, Perth Amboy, N.J., Jessie Owens, Virginia Beach, Va., Amber Smith, Ft. Worth, Texas, Selina Barrios, San Antonio, Texas, Alecia Gutierrez, Chicago, Ill., Ishika Lay, Jacksonville Beach, Fla., Takesha Edward, Houston, Texas, Lauren Fisher, Dania, Fla. (2010 Bantamweight National Champion), Sherry Whetten, Tucson, Ariz., Kymmberli Stowe, Millersville, Pa.
Kathleen Walsh, Rankankama, N.Y., Samantha Griffith, Pittsburgh, Pa., Rebecca Laborde, Tampa, Fla., Cashmere Jackson, Cleveland, Ohio (2010 USA Boxing National Champion), Jessica McCaskill, St. Louis, Mo., Urbana Hernandez, El Paso, Texas, Ariel Beck, Deer Lodge, Mont., Luvisa Matali, Denver, Colo., Griselda Madrigal, Wenataliee, Wash., Rachell Wehrle, Stafford, Va., Kendra Macon, Charlotte, N.C., Kristin Gearhart, Oak Park, Ill.
LaTarishia Fountain, Flushing, N.Y., Christine Poulauskis, Oakland Park, Fla., Amournix Stamp, Milwaukee, Wis., Lindsey Soderberg, Holt, Mich., Faith Franco, Duarte, Calif., Jen Johnson, Kalispell, MT., Diona Wigand, Lexington, Ky.
Christina Jenson, Centereach, N.Y., Franchon Crews, Baltimore, Md. (Four-time National Champion), Heather Bassett, Jackson, Tenn., Audrey Drew, Dallas, Texas, Tara Weisshaar, Burlington, Colo., Amy Castillo, Bakersfield, Calif., Fallon Farrar, Schofield Barracks, Hawaii, Tiffanie Ward, Hacienda Heights, Calif., Raven Barnes, Marquette, Mich., Kalita Marsh, Smithfield, N.C., Denise Rico, Los Angeles, Calif. (2010 USA Boxing National Champion), Alyssa DeFazio, Peoria, Ariz. (2009 National Champion), Tiffanie Hearn, Louisville, Ky. (2010 Heavyweight National Champion), Dara Shen, Fairfax, Va., Melinda Levasseur, Magnolia, Del., Tika Hemingway, Pittsburgh, Pa. (2009 Light Heavyweight National Champion), LaTeisha Darden, Wilmington, N.C., Danyelle Wolf, San Diego, Calif., Maria Dominguez, Wouchula, Fla., Jennifer Egan, Mohopac,NY, Marie Ybarra, Greeley, Colo.